The mind's terror of boredom is the more acute because the mind suspects that through boredom, through its extreme experience, another reality might be reached that would threaten its pretensions, and perhaps even dissolve them altogether. My recent listening has included Simple Lines of Enquiry, which the admirably enlightened Alex Ross describes as "Ann Southam’s immense, mysterious piano piece". In it Ann Southam (1937-2010) creates an extreme but rich experience by developing a single twelve-interval row for fifty-nine minutes. Simple Lines of Enquiry is a perfect example of what classical music should be doing - challenging conventions. Not the peripheral conventions of formal dress and silence between movements, but, rather, the more damaging convention of satisfying the Western mind's need to be entertained and stimulated, a need deeply rooted rooted in what Carl Nielsen described as the "deedless admiration for the conventional". 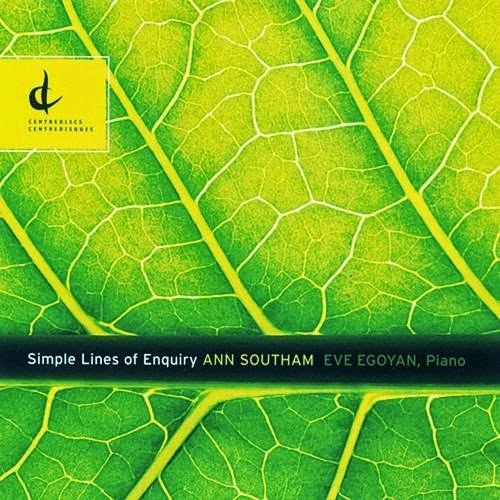 With its nuanced repetitions in the piano's lower registers, Simple Lines of Enquiry evokes auditory driving and meditative, or even trance states*. * A complete performance of Simple Lines of Enquiry can be found on YouTube. ** Our journey to Ladakh is entirely self-funded. But I have been fortunate to obtain a press pass for the Kalachakra empowerment. Should any media outlets be interested in commissioning coverage of the empowerment, please make contact in the next few days via the email address in the sidebar. No review samples involved. Any copyrighted materials is included as "fair use", for critical analysis only, and will be removed at the request of copyright owner(s). Also on Facebook and Twitter. Given that the (almost) complete works of Anton Webern require just three CDs, one would think that the idea of a twelve-tone work lasting an hour would have anyone seriously interested in music, in whatever capacity, bristling with curiosity. I suspect not, though, and that's very sad indeed, for this is a wondrous work. The phrase "twelve-interval row" is Southam's own, but I must confess that, at least without the score in front of me, I'm not sure what it means. My interim suspicion is that the work is based on a 'twelve-interval twelve-tone row'. People deterred by the length should know that it is in the nature of a suite in twelve parts, each self-contained technically should they wish to sample first. I'll just add that it would be nice if certain lazy critics would resist calling the work 'minimalist'. That is not the same thing at all. Very best wishes to you both as you journey to 'Little Tibet', Bob. I am envious! "... one would think that the idea of a twelve-tone work lasting an hour would have anyone seriously interested in music, in whatever capacity, bristling with curiosity. I suspect not, though, and that's very sad indeed, for this is a wondrous work." How right you are Philip. The problem today is not that the audiences can't cope, but that the critics can't cope.